Spoiler alert. If you haven’t read A Warrior’s Knowledge, don’t read any further. This is the first page of the prologue from Book 3, tentatively titled A Warrior’s Penance. 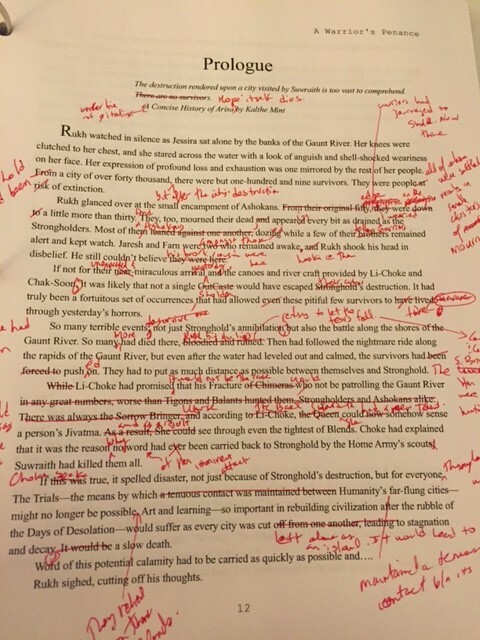 And this is what the edit of the first draft looks like. When I was younger there were writers who implied that they would write a book, and basically, all it would take would be some tweaking of their first draft, and BOOM! They were ready to publish. 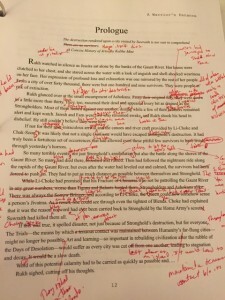 Then I’d read my work and feel completely inadequate given the crappy quality my own first drafts. Later, I discovered that those authors who claimed to only do a few revisions were likely lying. Don’t know why, but I never forgot that feeling of incompetence they managed to inspire in a younger me. So I thought I’d post something more typical of my work, and hopefully if there’s anyone out there thinking they can’t write worth a lick because their first drafts aren’t up to snuff, this will ease your mind. Notice all the red. It’s hard work writing a book so it resembles the story in my head. If this works out-and that’s a big if-I’ll be dancing like Carlton Banks at Christmas. There was once a huge part of me that felt like I wouldn’t be a real author unless my books were published by a big firm from NYC and sold in bookstores throughout the country. It was an elitist sort of validation, and right now, I don’t need it. I’m ecstatic by how well my books have been received and how many people have loved the characters and the story. That should be validation enough, and it is, but still, I would love to see the books in a store. Not because it would mean I’ve arrived as an author, which is really pretty silly, but because it would just be another avenue for people to discover my books. I write because I have to-the stories want out-but I also don’t want the words to die in the void; to simply sit on my computer with no one to have ever read them. There’s so much to be written on this topic of why people write and why they publish, but Aidan Moher, whose blog, A Dribble of Ink, won a Hugo last year, says it all with this post: Why I’m self-publishing my book.